This is the highest-resolution color departure shot of Pluto's receding crescent from NASA's New Horizons spacecraft, taken when the spacecraft was 120,000 miles (200,000 kilometers) away from Pluto. Shown in approximate true color, the picture was constructed from a mosaic of six black-and-white images from the Long Range Reconnaissance Imager (LORRI), with color added from a lower resolution Ralph/Multispectral Visible Imaging Camera (MVIC) color image, all acquired between 15:20 and 15:45 UT – about 3.5 hours after closest approach to Pluto – on July 14, 2015. The resolution of the LORRI images is about 0.6 miles (1 kilometer) per pixel; the sun illuminates the scene from the other side of Pluto and somewhat toward the top of this image. 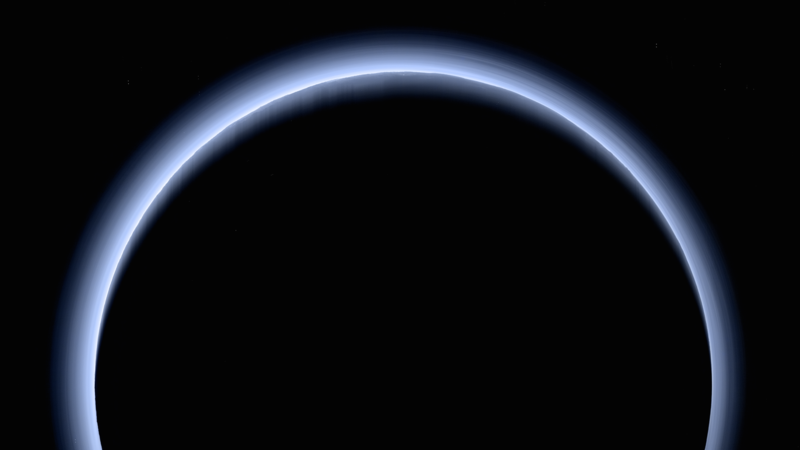 The image is dominated by spectacular layers of blue haze in Pluto's atmosphere. Scientists believe the haze is a photochemical smog resulting from the action of sunlight on methane and other molecules in Pluto's atmosphere, producing a complex mixture of hydrocarbons such as acetylene and ethylene. These hydrocarbons accumulate into small haze particles, a fraction of a micrometer in size, which preferentially scatter blue sunlight – the same process that can make haze appear bluish on Earth. As they settle down through the atmosphere, the haze particles form numerous intricate, horizontal layers, some extending for hundreds of miles around large portions of the limb of Pluto. The haze layers extend to altitudes of over 120 miles (200 kilometers). Pluto's circumference is 4,667 miles (7,466 kilometers). Adding to the beauty of this picture are mountains and other topographic features on Pluto's surface that are silhouetted against the haze near the top of the image. Sunlight casts dramatic and beautiful finger-like shadows from many of these features onto the haze (especially on the left, near the 11 o'clock position), forming crepuscular rays like those often seen in Earth's atmosphere near sunrise or sunset.